Net energy metering, or “NEM,” is a billing arrangement that provides credit to customers of solar companies in Sonoma County at full-retail value for the electricity they are generating and putting onto the grid – electricity that the utilities turn around and sell to your neighbors at full retail price. A law passed in 2013, AB 327, authored by Fresno Assemblymember Henry Perea, threw into question the future of net energy metering. It directed the California Public Utilities Commission to figure out whether changes need to be made to net energy metering to ensure fairness to all customers and to ensure that solar energy continues to grow. If I Have Solar Already, Will Net Metering Change For Me? No. If you’ve already gone solar, you are grandfathered into your current net metering (NEM 1.0) contract for 20 years from the point when the utility gave you the approval to power up your system. This grandfathering status remains with the system even if you sell your home or business and the ownership of the solar energy system changes hands. The only thing that will affect your grandfathered status is if you make significant changes to your solar electric system, such as adding new solar panels that increase capacity more than ten percent. 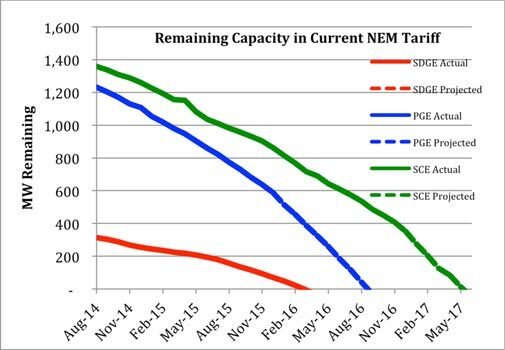 How Long Will The Current Net Energy Metering Program Be In Place? State law (AB 327) dictates that California’s investor-owned utilities (PG&E, So Cal Edison, SDG&E), continue connecting solar customers under NEM 1.0 until the total amount of net metered generation is five percent of customers’ peak power needs. Because the trigger is a percentage, as opposed to a fixed date, we have estimates on when the caps will be reached in each utility territory. Below is our best guess of when the caps will be reached. Fluctuations in the market may adjust this timeline, but not dramatically. If your solar energy system is interconnected before this cap is reached, then you will be grandfathered for 20 years of NEM 1.0. What Will NEM 2.0 Look Like? This is the million-dollar question! The utilities have submitted proposals that would greatly increase the cost of going solar for homeowners and business. They are proposing solar-only fees and charges that no other ratepayers are expected to pay. And they are proposing to cut in half the compensation for electricity you put onto the grid for sale to your neighbors. AB 327, the bill that put all this in motion, dictates that the CPUC “ensure sustainable growth” in the rooftop solar market but the final rules have yet to come out. If you want to weigh in on this important decision, visit SaveRooftopSolarCA.com and sign our online petition today. Check out this site for more accurate NEM statistics. For more information, please contact Westcoast Solar Energy at (707) 664-6450 or you can email us here.